WELCOME TO MY MONEY MISSION ONLINE: WHERE DID THE WEEKEND GO? And, I was having so much fun! 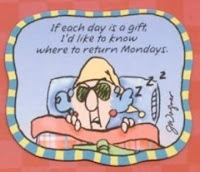 Then Monday just HAD to come! HA!! I spent the weekend doing some much-needed chores around the house. The temp reached 70 degrees here on Saturday, and I was loving it! Until the lady bug wanna-bees (those nasty asian beetles) "woke up," because of the heat, and started flying around everywhere. When they landed in my shirt and hair, I gave up and went inside. Ugh! What did all of you do this weekend? Can't get enough of those wonderful Home Made Simple Coupon Booklets? Well, there is another one out there, and even if you signed up before, you should be able to sign up for this one. It worked just fine for me. There's another Home Made Simple coupon book available with $35 in coupon savings. Do you have any idea what has happened to Sonya Ann? Her blog is gone! I know! I am so upset.....what DID happen to her? If anyone knows anything, let us know! I was swatting those darned "ladybugs" too! Ugh. 70deg...wow! what a great weekend..except the lady bug attacked....lol! our weekend was kind of mighty low...we just stayed at home and chilax (chill and relax)...lol! glad to be here btw...take care! Hi Lin! Aren't those "ladybugs" horrible? A friend of mine was trying to eat a donut when she was outside, and all of the sudden she was spitting it out, because, as she was chewing a bite of delicious donut, she realized that something tasted horrible! It was one of those nasty bugs! In her mouth! UGH!!!!! Sorry about the pesky bugs.We had a few Bees.Not enough to send us back into the house. We had great weather this weekend too but I was still getting over the flu. Thanks for the sweet comments and I am glad you feel better.